The books have been audited and a final report presented. Thanks to your support, we have paid the final amounts to seven charities. The books have been verified by an independent auditor Nexia SAB&T and a final report presented. We have a 100% donation policy. From left: #OperationSA activist Yaseen Theba, Yusuf Abramjee and Zaheerah Bham-Ismail. Almost R14-Million was raised in two months for #SAveSyria. Women’s groups raised R1,374 million through cake sales. South Africans donated R13 898 714,89 in just under two months to assist with humanitarian efforts in Syria. The #SAveSyria initiative was launched by #OperationSA in late December following scenes of devastation in Aleppo. Over the past few weeks, South Africans have been rallying together and donating to assist Syrian refugees through radio, television an on-line pledge lines, auctions and cake sales. #OperationSA donated R9 655 000 to seven charities shortly before New Year. Two weeks later, R100 000 was donated for an urgent eye operation for a refugee following a visit to the Turkish/Syrian border by a delegation from #OperationSA headed by Yusuf Abramjee and the Al-Imdaad Foundation. The beneficiaries are the Jamiatul Ulama SA, Africa Muslims Agency, Jamiatul Ulama KZN, Darul lslam Relief Fund/Muslim Judicial Council (SA), Islamic Relief SA, Al Quds Foundation/ Madressah Ihys Uloom Ud Deen and the Al-Imdaad Foundation. Today, the seven charities received a final payout totaling R 3 043714,89. They received R238 458,56 each. The Al-Imdaad Foundation received an additional R1,374 505,00 after various women’s groups hosted cake sales in late January. Another donor paid R100 000 to the Al-Imdaad Foundation. Islamic Relief SA matched their initial donation of R1m with another R1m towards #SAveSyria. 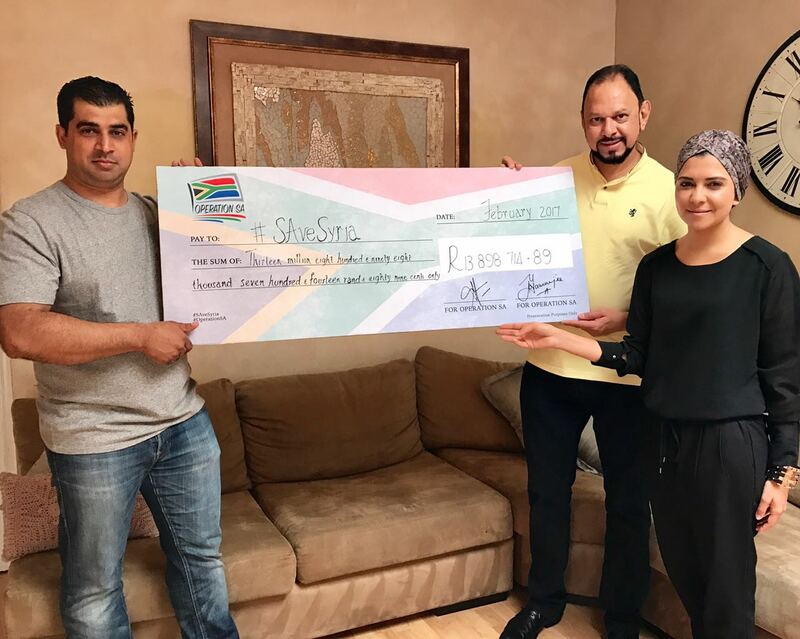 Abramjee said: “It was heartening to see fellow South Africans from all sectors of society digging deep into their pockets and making a difference over the past few weeks. “The response has been phenomenal. We thank all the donors, volunteers and sponsors. The Ubuntu we are seeing is touching,” Abramjee said. Abramjee said the charities have provided full reports of what they have done already and their plan of action over coming weeks. Auditing firm Nexia-SABT is in the process of a final audit and will submit a report soon. #OperationSA activist Yaseen Theba said a total of R15 173 576,00 was pledged since the fund-raising drive started in December. Almost R14-Million was paid and this reflects a recall rate of over 90%. “The recall rate is high and we appreciate it. The goodwill shown by South Africans has been phenomenal,” said Theba. The cake sales saw 32 different areas around South Africa collaborating to raise funds under the banner of the South African National Muslim Womens Forum (SANMWF) towards #Operation #SAveSyria. “All these organizations, among many other Muslim Womens groups, are instrumental in doing ground work in many areas across our country. Giving hope and assistance knows no barriers or borders. As South African women, we strongly felt the need of others and wanted to assist in any way we could,” said community activist Zaheerah Bham-Ismail. “We felt more could be done. In addition to raising funds, we wanted to create an awareness of the genocide taking place in Syria. A plea was sent out to various areas and in a short space of time women’s groups clambered to join the initiative. The response far surpassed our expectations. “Over R1,374-million was raised collectively. We decided to donate the money to the Al-Imdaad Foundation and it will go towards a Trauma Support Centre on the Turkish/Syrian border run by the IHH. This is where scores of women, many of whom were raped, are getting assistance. ” We are so grateful and appreciative of the giving SA spirit. Muslim Women in SA have paved the way to say no challenge is insurmountable and we can make a difference wherever we see a need,” added Bham-Ismail.